a course to Embrace Your FULL CREATIVE Power & SHOW UP as the POWERFUL CREATOR You ArE! ARE YOU SICK OF TRYING TO SQUEEZE YOURSELF INTO A LIFESTYLE THAT JUST DOESN’T WORK FOR YOU? READY TO DESIGN YOUR LIFE IN A WAY THAT SUPPORTS YOU TO THRIVE? I get it. You've been trying real hard and you're frustrated. You often wonder: Is there something wrong with me? NO, THERE ISN'T anything wrong with you. there'S something wrong with the system. Not you. The old hustle & grind, get it done, action + effort approach is set up for failure. It’s impossible to sustain for long periods of time and it’s not productive. The system is out of balance - which means... s o a r e y o u. No wonder you're feeling frustrated! Most mornings you're jolted into your day by your alarm, missing out on going for that run again, only to rush into a day that depletes your energy, with people who don't respect your boundaries and you end the day trying to escape your emotions, feeling unfulfilled, unsatisfied and like you can never get enough done. Your connection with your body is all about the output, you just want to do more but you're constantly lacking energy. Some days are harder than others and you just don’t understand why you can’t keep up. You rarely feel creative - who has time for that anyway? You're good at getting things done that other people have asked you to do, but when it comes to your own stuff - that can wait until later. If action + effort is one source of power, did you know we also have an equal opposite? When YOU combine the way YOU ALREADY know how to live, with this OTHER way of being - you have a perfect system. A system that will put an end to your frustration. A system designed for your success. A system that is sustainable, enjoyable & powerful. You’ll be way more productive and a whole lot happier & healthier! A SYSTEM YOU CAN USE IN YOUR PERSONAL & PROFESSIONAL LIFE AND BUSINESS THAT HONOURS YOUR BODY, MIND & SOUL. a system that SUPPORTS YOU to thrive. You wake up each day feeling energised and excited for another day ahead. Your day is set up to support how you are feeling, the action you are inspired to take and where you are in your cycle. That’s right! Your inner cycle. You respect your body and you look after Her so that she is feeling fully supported no matter where you are in your cycle. You have plenty of space in your day and you enjoy creating and bringing to life all of your projects. You feel connected to yourself, your body & the world around you. Life is your canvas! You surround yourself with people who make you feel great and you enjoy work where you feel valued and where your boundaries, especially your physical energy, is respected. You leave your working day feeling energised because you enjoy what you do, you feel fulfilled, satisfied, productive and you respect your natural flow. You create space for inspiration and spontaneity and you own your right to feel supported, to take up space and to express yourself in whatever way you desire. You consult yourself before anyone else always because you know you are your greatest counsel. Life feels good & you are owning your full creative power! I’ve been in your shoes. I understand your frustration. I know how you feel. After seeing many of my clients, friends and peers suffering with the same issues I experienced - adrenal fatigue, burn out, stress, frustration, a lack of creative drive & anxiety I realised that we all shared an over-reliance on our masculine energy (doing) and a lack of connection to our feminine energy (being). We were so busy doing, we didn't even know how to connect to this energy! I’ve created this online course to give you the tools to reconnect you with the missing pieces of the puzzle. I WILL teach you how you can have it all, by doing less and being more. Let’s create a beautiful, supportive & harmonious balance in your life that works with your flow and not against it in all areas of your life. We all have access to 2 distinct energies, known as masculine and feminine energy. Feminine energy is about being. Many of us, whether we are aware of it or not, are disconnected from our feminine essence. This source of energy has become unnatural. However, it is the most natural energy of all. It is our state of being. Instead, we have an over-reliance on masculine energy, which we are taught from a young age and reinforced through our education and adulthood for our success and survival. But we are missing the other half of the equation. Masculine and feminine energy are designed to compliment each other. We can only get so far relying on our masculine energy, just as we are limited when we rely solely on our feminine. This course will reconnect you to the different aspects of your feminine essence as well as teach you how to integrate this way of being with your masculine to create the lifestyle you truly desire. Lifetime access to the course so you can pop in and out as you need. A written Handbook/Slides for each module to further support your learning. The course is hosted on an inspiring, beautiful & easy to use platform that you will love! I will be adding bonus modules & resources as we go along at no extra cost! This course will take you through everything you need to know to embrace your feminine power & design your life in a way that supports you to thrive in a relatable, easy to understand & practical no-nonsense way, that you can integrate in your personal & professional life and relationships. What your 2 sources of power are, i.e. your masculine & feminine energy. The essence of your lesser known & understood, feminine energy. What I call the 3 pillars of feminine energy: space, rest & relaxation and receiving. How to fully & properly receive. 7 specially designed exercises, including a Guided Meditation to connect you personally with this topic. Why play, pleasure & curiosity are so important. How to build passion into your life. How to use the energy of trust, allowing & surrender in your day to day life & relationships. How to do less to get more. My personal approach to manifestation and co-creating with the universe. How to become sovereign using your emotional intelligence and inner voice. How to connect to + use your intuition, your emotions and your body to figure out the next best step for you. Why you will find clarity, direction and peace when you understand these amazing sources of intelligence. 8 specially designed exercises, including a Guided Meditation to connect you personally with this topic. The 4 different phases of the male + female hormonal cycle. How to work with the different phases & inner seasons of your hormonal cycle. How to connect with your cyclical nature whether you are experiencing a menstrual cycle or not. How to work with the Moon/Lunar cycle to bring to life your projects. Why the Moon cycle is a wonderful system to use to find balance in your life. The key phases & archetypes for our life cycle as women. Plus, I walk you through how to use this integration to align with your life purpose. 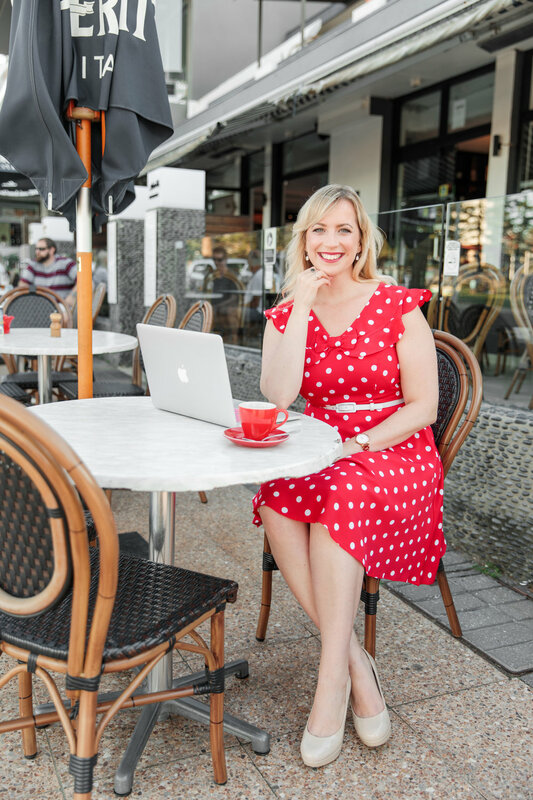 “When I first started EYFE, I was starting my passion project website (coaching business) and transitioning into a new role with my corporate job. I was struggling to integrate both masculine and feminine energy into my life. I wanted to learn more about both and how I can use them in harmony and not constantly in conflict with one another. If you had to describe your EYFE experience in 3 words, what would they be? Inspiring. Educational. Powerful. What did you love most about the the course? The content and our beautiful group of women. While I wasn't able to make any of the live calls, it was refreshing to be in a community that talks about these topics. I learned something from everyone when I listened to these calls. My favourite module was Module 3 - trust, surrender, and allow. It's natural for me to do the complete oppose of the these three things so this really complimented a lot of the work I have been doing previously to joining the course. The examples Leticia shared and the deep dive into the benefit of how this can serve us was great content! You can check out everything you get when you sign up right here. The course will be taught in video format (also available as an audio download). In addition, you will receive written Slides/Handbook for each module and Workbooks with specific exercises to use throughout the course and to support you on an ongoing basis. You can dive into the course work as little or as much as you like. The video content has been created to be easily digestable and to the point so you can get through the material quickly. There is approximately 8 hours of video content and 65+ page workbook, as well as accompanying slides/handbook for every Module. Enrolment is now open - the course is currently available as self-study, which means you can enrol & take the course as you like. When you enrol you receive immediate access to the course material. You will also be able to attend any future live intakes of the course. You will have access to the course material and content for life. If there are any updated versions of the course or bonus material, you will also be enrolled into those intakes. There are 2 options for enrolment - a single payment of $333 or 4 monthly payments of $90. This is an excellent price considering the course content & value that I am very proud to be offering. This is also the lowest cost option to work with me directly. All you need to do is choose one of the payment options and then you are in! My intention is to give you everything I used to build my own awareness over 4 years of study, learning & implementation. This course will give you the information you need to make big changes to your life so that you can live in you power and experience deep levels of fulfilment, purpose, satisfaction, creativity & productivity. Are you ready to LIVE YOUR life in a way that FULLY supports you to thrive?